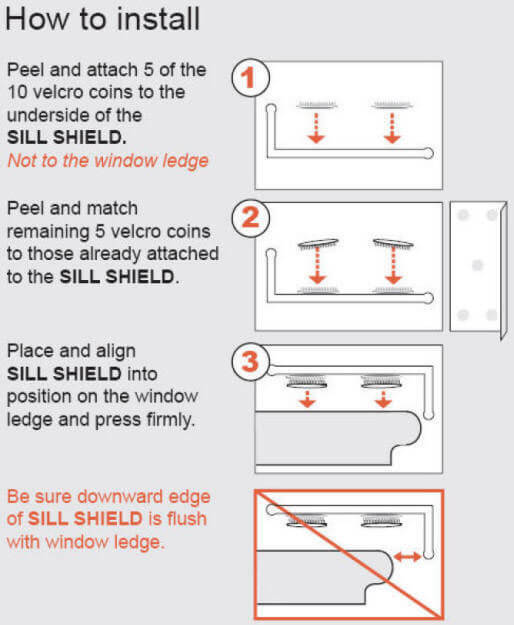 All my shields install quickly and easily with the use of peel & stick Low Profile Dual Lock Coins by 3M which are included. Dual Lock works like Velcro but it differs in that there is no fuzzy side. Any 2 coins will mate together and hold your shield firmly in place. Removing the coins permanently may leave a little sticky but that is easily cleaned with any household cleaner. Since 2006, no customer has ever contacted me with a problem removing the coins but for people who are really worried, you can substitute a product called Command Strips for the mounting coins. IMPORTANT: CLEAN YOUR WINDOWSILL THOROUGHLY BEFORE INSTALLING.